Preheat oven to 450°F. Spray baking dish with cooking spray. 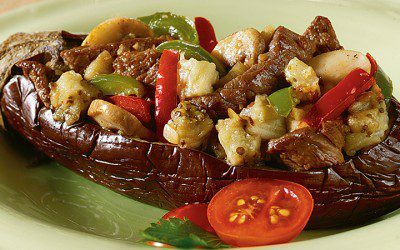 Place eggplant halves face-up in large baking dish. Pierce cut sides with fork in approximately 8 places. Sprinkle each eggplant half with 1/4 teaspoon salt. Cover with foil; bake 45 minutes. Meanwhile, spray large nonstick skillet with cooking spray. Add garlic and black pepper; cook over medium heat 2 minutes, stirring lightly. Add beef; cook and stir 5 minutes. Add bell peppers; cook 5 minutes. Add mushrooms; cook 5 minutes. Add water; stir and cover. Remove skillet from heat. Remove eggplant from oven, let cool 5 minutes. Mash cooked eggplant centers with fork, but do not break shells. Top each half with one fourth beef mixture; blend with mashed eggplant. Cover with foil; bake 15 minutes. Remove from oven. Garnish with paprika and parsley. Serving size: 1 stuffed eggplant half. Exchanges per serving: 2 1/2 Vegetable, 2 1/2 Meat.